I think we can all agree 2016 has definitely had its bad moments, from the deaths of David Bowie, Gene Wilder and Alan Rickman to the most recent deaths of George Michael, Carrie Fisher and Debbie Reynolds; it's safe to say the world has lost some incredibly inspirational icons this year, to only name a few of them. Yes millions of people die each year, it's a part of life that is the most evil, but when icons such as these die, it effects not only those close to them but people across the world who have been inspired by, found escapism in, or have simply enjoyed the work of these individuals. My mum told me earlier that we've lost over 40 celebrities this year, and although only a few blew up on social media or were featured massively on the news, each one effected a different age demographic and a different audience. For me, the death of Alan Rickman was the one that impacted my emotions the most, I grew up watching him in films such as Harry Potter and Love Actually, so to hear about his death was for me, incredibly heartbreaking. Although the deaths of these well known icons effected the entire world, we all have our own personal goods and bad's to the year too. For me, I faced one of my biggest challenges yet. I knew moving out of home to go to university wouldn't be an easy change, however I didn't anticipate how much I would struggle in my first few weeks either. As September crept closer, and the closer I got to moving to Wolverhampton, the sense of dread I felt just kept building up. I remember staying overnight with Paige in my new room a week or so before I moved in permanently and I popped into my room, leaving Paige in the kitchen and I came back almost in tears (I'm not sure Paige realised at the time) and it was just the thought of being left alone in Wolverhampton, not knowing anyone or anything, that just made me want to break down and cry, and for my first week there, I did. I don't think I've very faced anything so difficult in my entire 19 years. 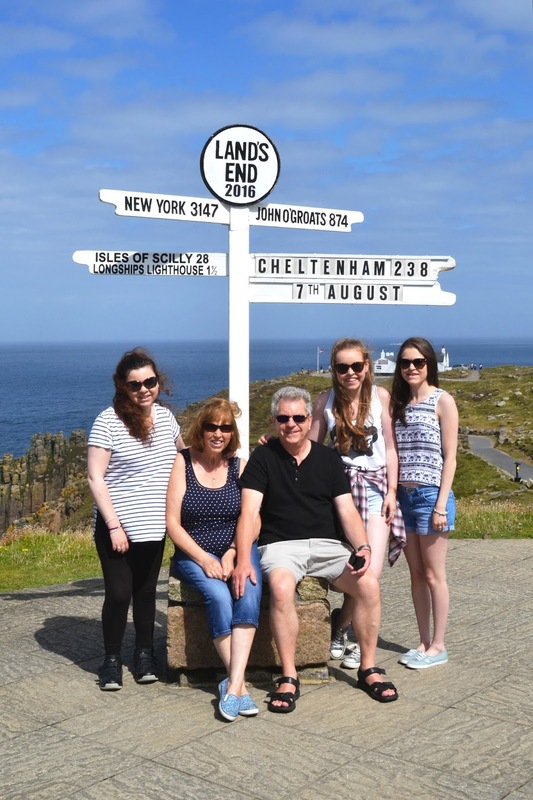 I knew I'd get a bit homesick due to being such a family orientated person, but I think everyone, not just me, were shocked at the degree to which I struggled in my first few weeks at uni. To be honest, I'm not a great person for change anyway, when I moved from GCSE to A-level I hated the difference in classes and routine, but it was one I soon got use to. But this was completely different, I didn't have my usual friends around me, or the teachers I had known for 5 years already, instead I had 5 flatmates I didn't know, lecturers that I knew I'd never get to know directly and I wasn't going home to my parents and sisters every night. Of course everyone adjusts to change in the end, even if it doesn't seem like you will in the beginning. I hugely considered dropping out in my first week and when I found out it wasn't financially possible I got even more upset. However, I found my ways of coping. I only stay at uni 3 days a week and whilst I am there I always ensure I'm in company or on FaceTime. I makes being there more bearable and I've even come to enjoy my bit of independence for the time I am there for. My friends I've made make being there worthwhile, and although we've only known each other a few months it's weird the bond you get living and studying with complete strangers, and now I don't know what I'd do without them. Even though the past few months were a huge struggle for me, there have been some upsides to 2016 too. 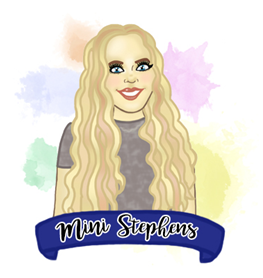 Before moving to university I had an incredible gap year, although it was only planned for me to work throughout it I tried to take every opportunity I had to do something different or fun. In the summer, me, Paige and Meg ensured we had the most incredible time; trying to fit in whatever we could, whether it be a meal out together or a day trip to Weston-super-mare, we all made some amazing memories that have made us stronger as friends and have helped us build an even better friendship. 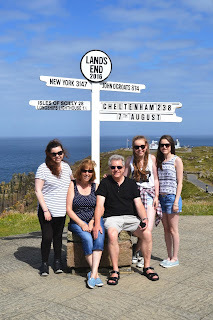 Although the few bits and bobs we did doesn't sound like much you don't need a lot of money to make a lot of memories - we had fun going shopping, and to London for the weekend without spending hundreds of pounds. Another highlight of my year had to be my family holiday to Mousehole, its a small place in Cornwall which is just incredibly beautiful and peaceful. You can read about that in my previous blog post here. My 19th birthday was also one of my favourite things about 2016, my family and I visited Cotswold wildlife park where I got to see my favourite animals (giraffes) in the close up, as well as various other animals, I most of all enjoyed spending the day with the people I love the most. And most recently - Christmas - I didn't expect much of Christmas again this year due to working in retail and although I wasn't feeling much Christmas spirit, I really did have a magical time. Me and my family lazed around, opened presents, had Christmas dinner - but most importantly we spent time together. And seeing my extended family on boxing day - my aunts, uncles and cousins is my favourite thing about Christmas, it's all about spending time with the ones you love and appreciating everyone around you. Every year has its ups and downs and although this year has been tougher than most it's also had its huge ups. And everything's about balance, you have to have bad to weigh out the good and you have to have good to weigh out the bad. The most important thing to me this year (and every year) was spending time with my loved ones, without their support when I moved to uni and their continuous love now I don't know where I'd be. All my good memories involve my family and friends too - it's not all about what the cost is - it's about making fun and loving memories that'll last forever. It's no secret I've been a fan of The Wanted since I was 13 years old, they were the one of the first bands me and my friends became a fan of and even though we became fans of other bands and artists along the way, nothing ever seemed to compare to them. (It's what we now call our 'fan girl phase'). Back in 2014 they announced their split (or 'break') and although we were all slightly heartbroken, we had all grown up since the early days, and we new there were only good things to come for them all individually. 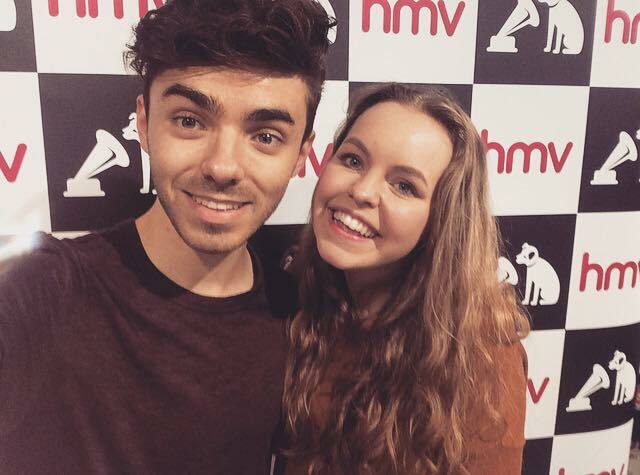 Fast forward 2 years and Nathan Sykes' first solo album has just been released. His first solo song More Than You'll Ever Know was released back in 2015 and soon followed was his first solo single Kiss Me Quick. Unfinished Business features both of these songs as well as his other hit singles Over and Over Again, Give it Up and Famous; all of which have been hugely successful with his fans and already began to give him an identity before the album was even released. Unfinished Business has been long awaited, however, it didn't disappoint. Nathan has chosen a variety of songs to feature on his debut album, ranging from more upbeat songs such as, Money, Freedom and Twist to slightly slower songs such as I Can't be Mad and Tears in the Rain. There are also songs I'd say are "feel good" songs and I think these are my favourite. There's Only One of You, starts off quite slow, however it slightly picks up at the chorus, and by this point you just want to join in with your own bad version of the song. The variety of songs that feature on the album show the versatility of Nathan's voice; with the range of tones he uses with each different song, and the different paces that range from slow to upbeat, his capability is more than shown within the album. This diversity also portrays both the fun side of Nathan and his more serious side. His more emotional side is clear in the likes of Famous and I Can't be Mad, however as soon as songs such as Money come onto play you just want to jump and dance. One thing I love about this album is that one minute you can be wanting to dance along and shouting the lyrics, and the next you want to sit deep in thought and just listen to the meaningful lyrics that accompany Nathan's incredible voice. Unfinished Business gives us more of an insight into who Nathan wants to be as a solo artist. This album gives him his own identity and individuality, separate from that of The Wanted and making him into his own artist. I may be slightly bias as a fan, but I can't find one thing wrong with this album. Although it's not to everyone's taste of music, you can't always please everyone and I think this album should be listened to with an open mind, I'd say the songs are a huge difference to those created by The Wanted and the more grown up tone of Nathan Sykes is a lot more matured and impressive. Unfinished Business is now available from a range of retailers, click here to go directly to Nathan's online store. 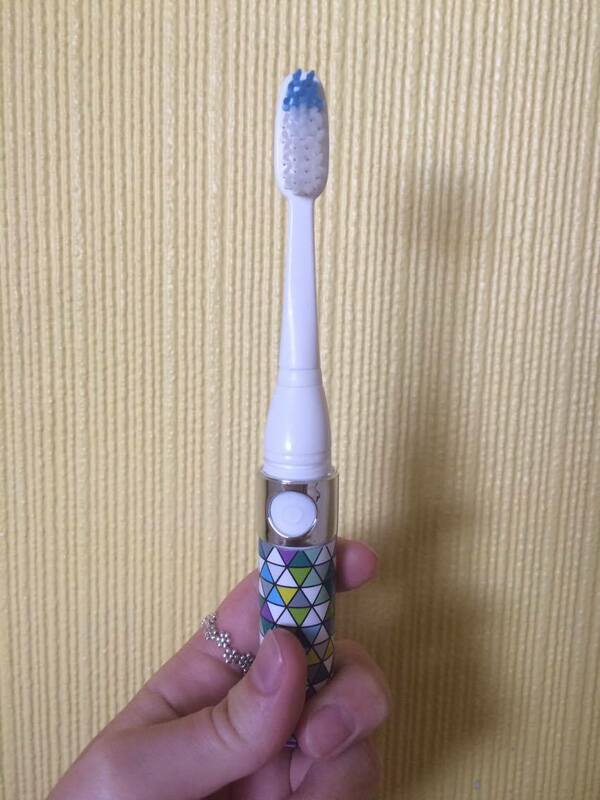 Me and my family have been using Oral B electronic toothbrushes for many years, so when I heard about an opportunity involving Sonic Chic, a travel electric toothbrush, I thought it would be a good chance to try a portable brush, that I can carry around with me to sleepovers, weekends away and holidays, something that's better quality than a regular toothbrush but isn't too big or bulky. 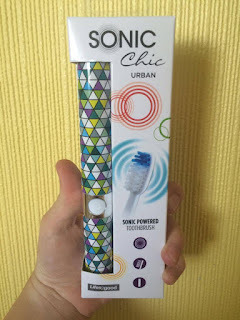 I received my Sonic Chic toothbrush a few weeks ago now, but in-between everything else I've only just gained the chance to try it out and review it. I wasn't really sure how to use the brush - even though the instructions tell you how to un-cap it and what to do after use - I was more confused with whether I was meant to let the brush sit on each tooth individually whilst it vibrated (similar to what you do with an Oral B one) or whether you were meant to brush your teeth the regular way, like you do with a manual brush. But after testing both theories and the vibrations getting slightly out of hand when I cleaned my teeth the regular way - I eventually decided to just move the brush around slowly, so I was cleaning all teeth but the vibrations weren't uncomfortable on my teeth and the brush wasn't going into overdrive. I found the brush ok - not as good as the more expensive Oral B one - but what can you expect from a portable toothbrush? My teeth felt clean after brushing - as they should do - and probably more so than when you clean with a manual brush. It's not a toothbrush I'd want to use everyday as it's not the most comfortable experience, however as a holiday toothbrush - and having minimal use of it - I'd say the pricing of £20 in Boots, isn't too costly for the ok quality of the brush. However, if you're looking for an everyday electronic toothbrush I'd probably recommend a higher market product - as even though they're more expensive your teeth will probably get a better brush. I love the pattern on the brush as well - there are various patterns you can choose from when you buy the brush, which I think is great as it makes the brush bright and exciting to use. Although I got sent this geometric pattern one by chance - I love the colours in it and it's a pattern I would've chosen myself if I'd had the chance. It's great that it comes in different styles - especially if children are going to be using it as it'll make them more excited to brush their teeth. 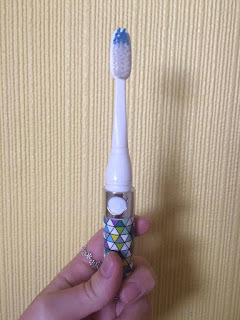 I'll definitely continue to use the Sonic Chic, travel toothbrush when I go to sleepovers or nights away as it'll save me carrying around my slightly bulkier normal electric toothbrush, and it'll give my teeth a better clean than I'd normally get with a manual toothbrush. Have you checked out the Sonic Chic Electric Toothbrush? If so how did you get on with it? "A healthy smile, is a beautiful smile"
After booking tickets to spend the weekend in London and deciding Matilda was the West End show me and my best friend, Meg, wanted to see; we arrived in London on Saturday 25th June and after our bus didn't turn up and we initially couldn't figure out which tube line to take, we started to have a bit of a panic and I wondered why we ever thought it was a good idea to come alone to London in the first place. But, after we eventually managed to make it to Shaftesbury avenue, where we seeked out the Cambridge Theatre and went to the Theatre Cafe for lunch, things started to seem a little bit brighter and we both started to actually enjoy ourselves. Matilda The Musical is based on the children's novel 'Matilda' written by Roald Dahl. It was adapted into a musical by Dennis Kelly (with music and lyrics from Tim Minchin) and although he changed a few things about the story such as writing a part for the librarian who runs the library Matilda visits, and including more of a base story for the history of Miss Honey's mother and father; there were reasons for these changes, he wanted to keep Matilda's love for books in the play - as this is one of the main character values for Matilda - so to do this he changed her love for books into a love of stories, so the play stayed interesting for the new and old audiences and this meant we continue to love the story, in it's new musical form. The most iconic parts of the play were also kept in the musical, these were parts of the story such as Amanda being swung around by her plaits and launched into the air, Matilda's unique gift of moving things with her eyes and Bruce being forced to eat a whole chocolate cake; all the parts of the story that we instantly think of when we think of Matilda were kept, for me, these are the most memorable parts of the story, they show what a horrible character Miss Trunchbull is and the karma that follows these vile acts, comes back to bite Miss Trunchbull on the bum, and helps add comedy to the story; these iconic moments are therefore very important to the story of Matilda as they hold the basis of why the children start playing naughty pranks on their headteacher in the first place. Matilda is an extraordinarily clever 5 year old girl, with horrid parents, Mr and Mrs Wormwood - who never wanted another child, and a dumb older brother who has been brain washed by the rubbish TV he's watched his whole life, Matilda is a lonely girl who visits the library and reads books as a way of expanding her mind and finding some happiness within her lonely life. Her cleverness completely overthrows her parents and she outwit's them throughout the book and musical , making them look stupid and act silly - which adds further comedy to the story. Miss Trunchbull is the horrid Headteacher that runs Crunchem Elementary Hall, the mean Aunt of Miss Honey, she gets away with vile acts that no normal headteacher would be allowed to do - the Chokey is one example of a punishment she carries out on the children and her character was always one that scared me when I was younger; with the greasy hair and the largeness of the character - next to that of the tiny children never failed to make me terrified whilst watching the film or reading the book. The children continually carry out pranks on the headmistress and there's always the fear they're going to get caught no matter how well you know the story. Its the fact the children actually carry out these naughty acts, that shows how brave they are and Miss Trunchbull's karma comes from a lot of these naughty pranks. Miss Honey is Matilda's kind and caring teacher - Miss Honey is blown away by the fact Matilda is so clever when she's only 5 years old and although Mr and Mrs Wormwood and Miss Trunchbull both try and deter Miss Honey from helping Matilda - it doesn't work and Miss Honey becomes the mother that Matilda never had, as well as bonding with her over stories/books. She's the only character in the story that really believes in Matilda and helps her develop her gifts. She protects all the children from Miss Trunchbull - even though she is terrified of her Aunt; and when she meets Matilda she starts to find her bravery to stand up to her - which first comes clear in the song "Pathetic" when Miss Honey - despite being scared - knocks on her Aunt's office door and talks to her about Matilda's extraordinary cleverness. The Children aka Matilda's school friends are Amanda, Bruce, Lavender, Alice, Eric, Nigel, Tommy and Hortensia - these are the amazing children that help make the play feel realistic, they give Matilda friends, give Miss Honey's class actual students, create mischief like Lavender putting the Newt in Miss Trunchball's water jug, add comedic moments - like Nigel's inability to hold up an exercise mat in Phys-ed, they dance on their desks and get frightened by the older school kids in the school and I think the musical would be a lot duller without these characters being portrayed by actual children; yes adults can play children just as good as actual children can - but there's something about their innocence, cheekiness and fun way of going about life, that I think made the play a lot better by being portrayed by the young actors and I think this decision, made by Dennis Kelly and the director - Matthew Warchus - was the correct one. Mr and Mrs Wormwood are Matilda's mean parents - at the beginning Mrs Wormwood has no clue she's pregnant and it's straight away obvious neither parent cares about their daughter. With Mr Wormwood constantly calling her a "he" and them both constantly finding Matilda irritating as she disagrees with their crooked ways. These two characters also add a lot of comedy to the play - their stupidity because of their simple lifestyle makes them humorous and as Matilda constantly out wits them throughout the play which adds to the comedy in the story. I think Mr Wormwood's simple mind, silliness, over-gelled hair and weird green suit made him one of my favourite characters from the show - I found his crazy mannerism's absolutely hilarious and this just made me love his character even more. Strangely, the next morning me and Meg saw a man that looked and spoke exactly like Mr Wormwood, it was really weird how similar they were but also hilarious; because the man probably had no idea that he looked like a well-known character that was purposely styled for comedic reasons. My favourite songs from the show are "When I grow Up" and "Revolting Children" both of which featured in Act Two of the show. The Swings that were used in When I Grow Up made the scene quite magical to watch. The children and adults effortlessly make all the swings in-sync throughout the scene and I think this just made the whole thing absolutely incredible and it was probably my favourite part of the show to watch as it bought out the big kid in me and had my enraptured throughout the entire thing. Revolting Children was amazing as well - Bruce began the song and I really love how he gets to show off his outstanding vocals. The high energy in this scene is great - and I think this is one of the things that made me absolutely love it, the characters take what Miss Trunchbull says about them and turn it against her - having fun whilst singing and dancing along to a song that is taking the mick out of the horrible comments that are meant to offend them - they are beating a bully by not letting her untrue comments effect them. I also love how all the children are included in these two scenes and you can tell they're enjoying every moment of it - just as the audience is. I would hugely recommend going to see Matilda The Musical, it's a fun filled family show and in my opinion it was absolutely incredible, I couldn't rave about it enough. If I had the opportunity to see the show again I would jump at the chance; it's one of those shows that you know you could sit through a hundred times and not get bored; sort of like a good movie or a good book - both of which I've seen/read many times in the case of Matilda. And I can't stop listening to the Matilda soundtrack - the songs are so catchy and they're making me reminisce on a great evening/weekend away with my best friend. "Just because you're little, doesn't mean you can't do a lot"
To find out more about Matilda The Musical click here to visit the website. Deciding to go on another health kick, I was getting kinda bored of having the same old cereals and fruit for breakfast and I wanted to try something new; eating the same old things was making it difficult for me to be healthy and I wasn't enjoying what I was eating. Spotting this recipe on the back of a weetabix box, I thought I'd give it a go and see if I enjoyed it - I thought it was the answer to trying something new and mixing up my breakfast routine a bit. Safe to say it was both enjoyable and filling - perfect for a breakfast time. The smoothie just tasted like eating a weetabix for breakfast except it was in drink form than a solid form. It's also a really good recipe to follow if you haven't got time for breakfast in the morning - it's a great thing to have on the go, as well as being really healthy, nutritious and full of vitamins. With this recipe I used my Kilner Drinking Jar, and I filled it to the top with some leftover mixture as well, so if you want to make this smoothie for two or more people I'd probably double or triple the batch. 3) Grab a literal handful of raspberries and strawberries and place these into the blender with all your other ingredients. 4) Blend all your smoothie together until it is smooth, tip it into a glass and enjoy! Including less greek yoghurt and more milk may be the answer - as this would make the smoothie a bit thinner as well, as including so much yoghurt did make it quite thick. If you don't like Raspberries/Strawberries, only include one or the other. Both are only included to add more flavours to your smoothie. "In life, much like smoothies, you get out what you put in"
Hire My Outfit is a company ran by Jude Gilchrist. 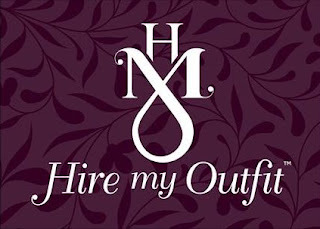 The company she has produced and created Hires out outfits to their customers for different special occasions - they have various Cocktail Dresses, Prom Dresses, Bridal Gowns, Wedding and Christening outfits, Office Wear and Outfits perfect for a Day at the Races - all of which you can look at online. 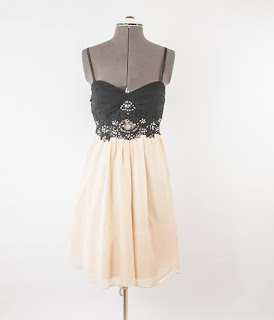 You can decide which dresses catch your eye, then give Jude a ring, ask to pop over to her house and try on a of the few outfits you like. You can even take your friends and Partner with you, let them sit watching TV and having a glass of wine, or a cup of tea whilst you put on a bit of a fashion show and try on different dresses, shoes, hats, pashmina's and decide which outfit you love most; and the best thing? If you hire the Dress you pay nothing to hire the matching shoes, bag, hat or pashmina - if they're avaliable to use. 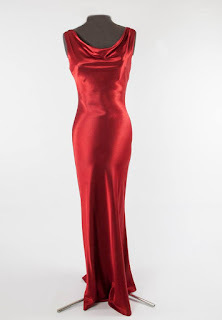 The whole idea behind the company is that you don't have to worry about trekking around town for hours on end trying to find a suitable dress for your special occasion, that's only getting closer and closer, you don't have to buy a dress that you'll probably only wear once, which will then be cramming up your wardrobe for the rest of eternity, you can visit a nice cosy home with a friendly host and it'll save you getting aching feet and complaining partner. Another thing that Hire My Outfit offers is Making your Wardrobe work for you. Statistics show that most women only wear about 15% of the clothes in their wardrobe, that means the other 85% of clothing is pointlessly cramming up your wardrobe with space you could be using for nice new clothes - ones that you'll actually wear. Jude offers a service which means you don't have to make a trip to the charity shop or mess about trying to sell your clothes on e-bay - using critical time you could be working or spending with your family - washing, ironing and photographing all the clothes you want to sell; she comes to collect your outfits, steam cleans them, photographs them, stores them and then puts them on the Hire My Outfit website for other people to wear (and then pay's you!!). This means other people can wear and enjoy the clothes you enjoyed wearing once or twice; other people can make long lasting memories wearing the same special dress that you once loved and that made you feel like a princess - what about that isn't appealing? Plus you'll get all your wardrobe space back and the excuse to buy lots of new clothes. I personally think the whole idea behind Hire My Outfit is a great one. With Prom season looming it's the perfect excuse to give Jude a visit and try on some of her frocks - it's a fun way of avoiding shopping if it's not really your cup of tea, but you still get the whole experience of choosing and trying on different dresses with your Mum giving you different opinions on each dress until you eventually find the frock that you know you could just wear forever, given half a chance. And even if you're unsure on the whole idea of hiring an outfit instead of going to a high street store and buying one - why not give it a chance, visit Jude and see how you get on? 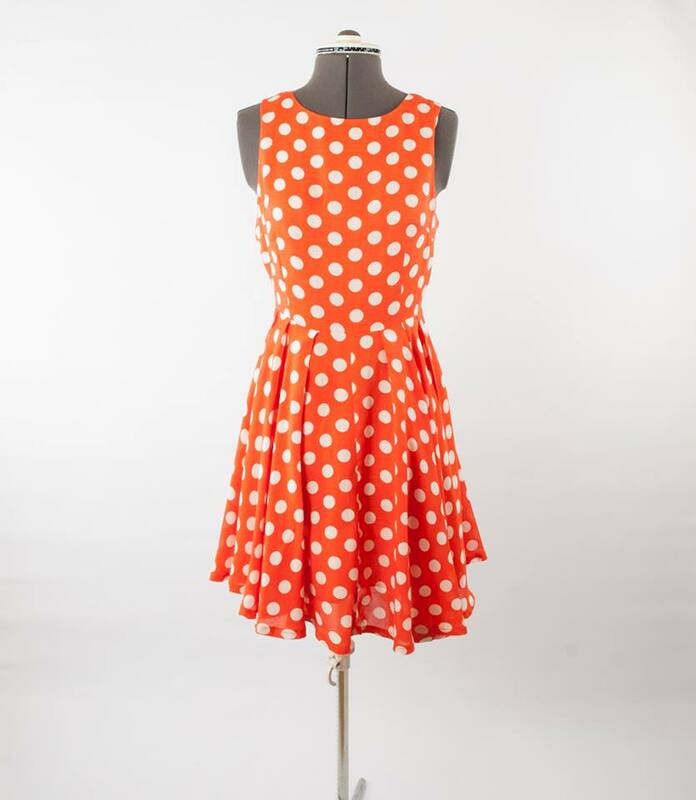 There's no pressure to hire the dress then and there - maybe go away and think about it - but you never know you may love trying on the frocks and becoming a Frockette. 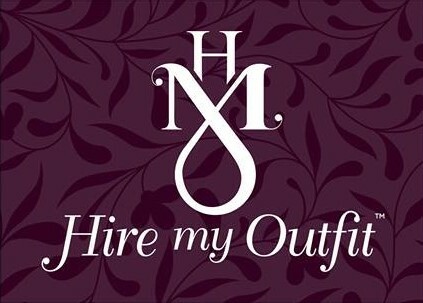 To visit the Hire My Outfit website click Here or to visit their Facebook page click Here! 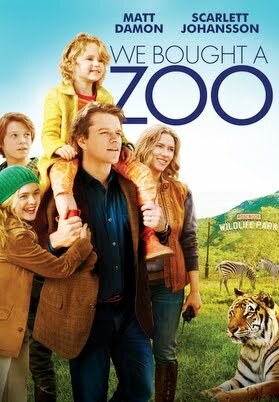 "I think that playing dress up begins at age five and never truly ends"
Released back in 2011 and based on a real life family, We Bought A Zoo follows the story of Benjamin Mee who after his Wife passes away, decides to make a fresh start, by quitting his job and uprooting his children to an 18-acre property containing the Rosemoor Wildlife Park (aka Zoo). Although the Zoo got closed down several years previously, Rosemoor still homes many animals, all cared for by Kelly Foster and her small team of staff. Benjamin opens his heart and checkbook to the Zoo, although he hasn't the faintest idea about how to care for animals; Kelly and her team slowly teach him and his children how to run a zoo as they renovate and reopen it to the public. Rosie, Benjamin's 7-year-old daughter is happy about the move from the city to the Zoo, quickly adjusting to life at the park. and enjoying caring for all the animals, her enthusiasm is an adorable trait of the character. However, Benjamin's teenage son, Dylan, is less enthusiastic, struggling with moving away from his friends he retreats into his artwork which has become more dark and gruesome since his Mother's death. Dylan's grumpy mood and bad attitude is prominent throughout the film; making his Dad more stressed and eventually hurting his new friend, Lily's (Kelly 13-year-old Cousin) feelings. I think this character is quite relatable, representing how teenagers struggle with adapting to big changes in their lives, such as family deaths or moving house; they retreat more into themselves and their hobbies as they struggle to talk and open up about how they feel, they feel the need to hole it up inside rather than burdening their loved ones with their feelings - Dylan's character portrays a major theme in this movie. The parent-child relationship between Benjamin and Dylan is also very relatable to the target audience for this film (which is families). Their relationship shows how not knowing how to communicate with their children can be a big problem for a lot of parents, as they don't know how to get their children to open up and talk to them about their feelings. Eventually these two characters resolve their problems by bonding over Dylan's friendship with Lily. 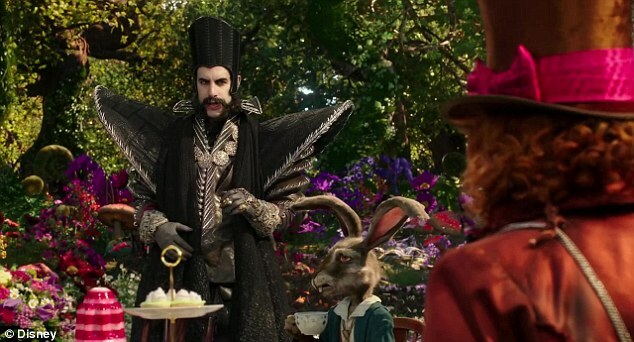 Although this film is nearly 5 years old, I still absolutely love it, how the characters work through and solve all their problems throughout the film, makes the film very family orientated. 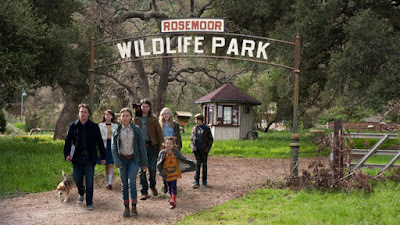 The fact the plot revolves around a family death makes it very relatable - it shows how different people and families deal with their loss in different ways, and after re-opening the park it's very obvious how Benjamin made the right choice in moving his family away from the city, as although he face a lot of troubles along the way, him and his kids are happy and they have a new family too - the small group of staff and the animals. 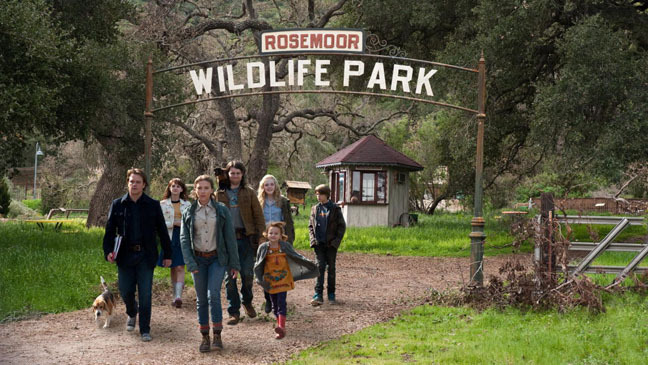 If you haven't already I would hugely recommend watching We Bought A Zoo, the plot isn't action based but the constant issues the family face on their way to re-opening the Rosemoor Wildlife Park, makes the movie interesting as you're constantly wondering how each probably is resolved and you become quite attached to ensuring the family have a happy ending that you can't help but continue watching the film. "Sometimes you just need 20 seconds of insane, embarrassing bravery and I promise you something great will come of it"
Thank you for reading my A-Z April blog posts, although it's been a lot of work (and way more stressful then I imagined) I've enjoyed thinking up and writing every single one, and I hope you've enjoyed reading them. Starting out Youtube with my best friend Meg back in 2013, we first thought of the idea after joking around in our English class at school that we were the next Ant and Dec. I can't even really remember where the idea came from; but the idea of Meg and Al started out as a bit of a joke and after mentioning to Meg that we should actually create Youtube videos as a duo - it became this great idea that made us change from school friends that only talked in class to really close best friends within a couple of months. And now it was probably one of the best ideas we've ever had; I don't know what I'd do without Meg now. We planned to post one video every Saturday which worked out for the first month or so, but when our GCSE exams came around it kind of fell through and we just posted a video every so often; eventually stopping altogether for around a year, due to my a-levels and Meg's college work. Until recently, when we started up filming again. Our first vlog was a typical "Introductory" video; we both look so young, and I'm so awkward in front of the camera it's quite embarrassing to watch back now. But it was our starting point, whatever we created back then, of course we're going to have a different outlook on it now, now we're a few years older. Our favourite videos are the ones where we've filmed memories and day trips with our friends; being able to look back on that specfic day whenever we want to and remember the trip not only through photos but through a video is amazing; a video helps refresh your memories better than photos do - you can actually see yourself and your friends laughing and smiling regularly and you can laugh at a joke that was told in the video that you had forgotten about previously - it makes all the time of holding up a camera, or walking behind your friends instead of running ahead with them worth while as you capture different moments. Even when the editing can get a bit tedious - laughing at hilarious moments in the video footage makes it so much fun. I would recommend to anyone starting up a YouTube channel, just to be able to film and upload videos of memories with your friends and family, that are easy to look back on months, or years later. It's nice filming and uploading vlogs and videos that aren't trips to Weston or Bristol too; mine and Meg's first cooking video was so much fun to film and so was our Pretty Little Liars tag. It's nice just sitting down with a camera and a video plan, and filming with your best friend sometimes and it mixes our channel videos up a little bit too and gives us some variation. Even just an hour or so after filming me and Meg always question and wonder what we were doing in some parts of the video footage. Although it's gotten easier to watch ourselves back and cut down bits of footage, we still cringe at ourselves sometimes and get annoyed at how we were acting; but I think that's always going to be the way, we're always going to criticise ourselves and want bits cut out of the final video, but that doesn't matter, as we improve each time we film, we know what works and what doesn't on our channel, we know our style, and we film because we have fun and we enjoy filming together, not because we have to. To visit mine and Meg's YouTube channel click here! 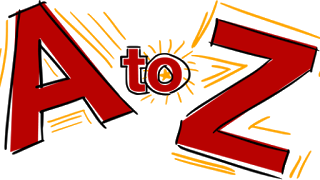 Now this may seem like a strange thing to write about for A-Z April, but honestly I couldn't think of anything else to write about other than Christmas. I mean there's next to none words that begin with X anyway so who can blame me? Christmas is my absolute favourite time of year. I love wrapping up warm, in my coat and scarf and having walks around town looking at all the Christmas lights and Christmas trees, it just feels magical. Even if we're just driving through town or a village, me and my family spend the whole journey spotting different Christmas lights/decorations and commenting on whether we like them or not. There's nothing like coming home afterwards wrapping up in a blanket in front of a Christmas film and having home made hot chocolate with cream and marshmallows, it just makes me feel content and happy, despite having to work through the Christmas period (ah retail) knowing I can still have my cosy evenings and Christmassy afternoons makes everything better. Another one of mine and my family's favourite Christmas activities is visiting different Christmas Markets - similar to seeing all the Christmas lights around town, whenever we hear about, or come across a Christmas market in a small town or village we normally can't help but visit them. There's always an amazing atmosphere, with everyone in the Christmas Spirit and feeling jolly you can't help but get excited about Christmas Day and it makes buying Christmas gifts actually fun rather than stressful. My parents are rather good at resisting temptation in buying something from every Market we go to, but I haven't seemed to knack that trick yet. I always return home afterwards though, feeling content and Christmassy and that's probably one of my favourite feelings ever. To read a bit more about my Christmas Market adventures click here to read my previous blog post on Gloucester's Victorian Christmas Market. My mum goes all out with our Christmas decorations - honestly, although we don't have a lot (if any) decorations on the outside of our house as soon as you enter the hallway we've got lights and hanging decorations all over the downstairs of the house. We change our mantel piece and side board decorations for Christmas themed ones and we have window stickers, a knitted nativity play - you name it, we probably have it. But although it is a lot to set up and clear away (the most depressing job of the year) it's all worth it for a few weeks of lights and decorations, as it makes our house feel Christmassy and it helps put us in the Christmas spirit. I can't imagine our house without all the decorations now; my mum's done it ever since I can remember so to be without them all now would make the house feel bare and empty over the Christmas Period. What traditions or decorations do you have over the Christmas period? "The best gifts around any Christmas tree, is the presence of a happy family"
The Huntsman Winter War is a Prequal/Sequal to the first movie in the franchise - Snow White and The Huntsman (Released back in 2012 it stars Kristen Stewart as Snow White). The beginning of the movie starts in the past. Before the Huntsman ever met Snow White. It shows how Freya, after being betrayed by her evil sister Ravenna (The evil step mum/queen in the first movie), releases her power of turning her enemies into ice. She then retreats to a northern kingdom to create an army of huntsman from young children; so when they become adults they can be her protectors. Freya believes to love anyone or anything is a weakness, so she teaches her young soldiers to never fall in love, and has one law in her kingdom, don't love. When Eric (Chris Hemsworth and The Huntsman in the first film) and fellow warrior, Sara, break this law and fall in love, the angry ice queen does whatever she can to stop them. 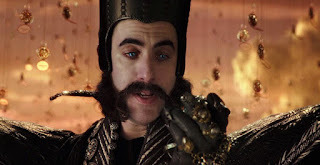 Even making them think the other has betrayed them, the film then skips to the future (after Snow White) and the couple meet again as the war between them and the siblings escalates, Eric and Sara return to Freya's kingdom and in the climax of the film they end up working together to end Ravenna's wicked reign, once again. 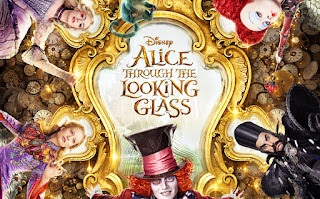 I thoroughly enjoyed watching this film, the fast pace meant it was constantly moving and at times it was very tense, however, they also included light hearted comedy within some of the characters (such as the dwarfs) which made the darkness of the story actually seem a bit lighter as the banter between the characters made the life threatening situations not seem as terrible as they actually were. 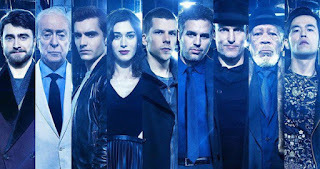 But, one problem I did find with the plot was that between the two films it didn't seem to connect together very well. They mentioned Snow White and how she defeated Ravenna, however, the issue I found was within Ravenna's family. In the first film Ravenna was really close with her brother, Finn, and when he died it was as if a part of her had been killed as well, but he isn't mentioned at all in the second film, it is like he no longer matters to the character or that he didn't even exist. This is the same with Freya, a sister to Ravenna and Finn doesn't seem to exist in the first film, she isn't mentioned at all but when she appears in the second film it's as if she's existed the whole time. Also, Ravenna's power came from her mother "By fairest blood it is done, and by fairest blood it can be undone" is one the major quotes from within the first film; but Freya seems to just have her power within her that she releases at the beginning of the film. This is one of the other things that doesn't seem to make sense to me, how can Freya just have power when their mother seemingly gave Ravenna her power? Considering all of those things I did still really enjoy the movie, it's good as an individual film and the acting is absolutely incredible. The character development for the Huntsman/Eric is also really great to see; it's interesting as an audience member to see who his 'Wife' is and where he comes from - how he became a huntsman in the first place. 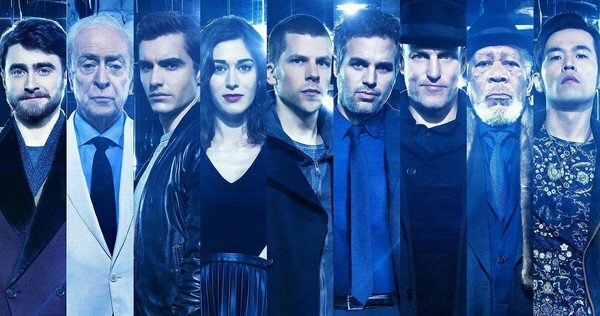 You do need to see the first movie to understand this one, however I would hugely recommend going to see it as the plot is exciting and funny and you're constantly wondering what antics the characters are going to get up to next. 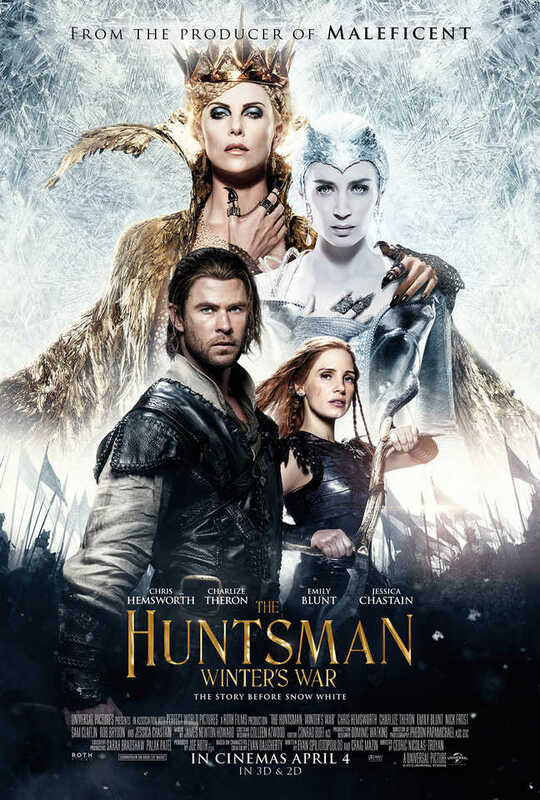 The Huntsman: Winter War is currently still in cinemas, so to see film times from your local cineworld click here! "Love does not make you weak. It's all that ever gave you strength"
Finding out about The Vamps from one of my best friends, Ellie, back in 2012, I constantly put off checking out their covers on YouTube until one day in December when Ellie won a competition to speak to James on the phone, and she sent me a link of their One Direction Little Things cover. I instantly fell in love with Brad's unique tone of voice and within 24 hours I had all of their covers on my iPod (ah the fangirl phase). After telling my sisters and friends about them, none of them seemed overally bothered about my new discovery, until one of my friends, Georgia, told me she'd also heard about the band, and we bonded over our mutual love for them. When they came to Gloucester for the SportBeat Festival in 2013 we knew we had to see them live, spending £30 just to see them live for 20 minutes was definitely worth it, we easily got front row and meeting 3 out of the 4 members was 100% the highlight of the day. Looking back we realise how lucky we were, it's crazy how easily we met them because they didn't have thousands of fans at the time. So instead of hundreds of people being there for them, there was only 50-60. I remember meeting James the most - he came out from backstage to buy an ice cream from one of the vans and I was just so lucky to be stood watching Wimbledon on the big screen at that exact moment that I saw him walking towards the exit; so before anyone else could notice I ran and got the others and we stood behind him in the line and I nearly missed my opportunity - I was so terrified to ask him for a photo I physically couldn't move - so as he walked away my sister shoved me forward and said "Can she have a photo" and after an awkward pause where he knew he needed to get backstage before he was swarmed he said "yeah sure" and I can barely remember the moments after. We saw them live not long afterwards and then as they came off stage we went to wait beside the metal fences around the side, where we met Connor and Tristan. After that experience we knew we had to see them again, and I was lucky enough to see them on The Wanted's tour in March 2014. They were also doing their first headline tour later in the year, so when we found on they were coming to Cheltenham in October we were over the moon - it was right on our doorstep and getting tickets right near the front just topped it off. It was weird seeing them get so big in under a year but after supporting McFly and The Wanted on their tours and releasing their debut album they had quickly built up a fan base. Its strange, since getting older, growing up and passing "the fan girl" kind of phase in my life I always forget how much I love going to concerts and seeing The Vamps perform so the days before hand I start thinking "Why did I even get tickets" but when I get there and there's this amazing atmosphere I couldn't be happier that I decided to go - it helps lift any bad moods and you just don't have a care in the world for those few hours. Who's concerts have you been to that you really enjoyed? "It's a place where we can forget about our problems for a little while"
Earlier this year I decided I wanted to change up my bedroom wall, making it more grown up and tidier; I bought a cheap cork board from hobby craft and decorated it with old cinema tickets and flyers, that I had been collecting for the last three years. So I thought I'd share how to create your own unique and decorative pinboard in a really easy way. 3) Stick your ticket/flyer down, putting pressure on it until it's completely stuck down. 6) Decide where you want to hang your pinboard and hammer a picture hook into the wall - then hang the piece of wire on the back of your pinboard over the picture hook. 7) Using drawing pins or Push Pins attach all of your favourite photos, tickets, or other souvenirs to your pinboard! 1) Remember you can layer some of your tickets and flyers over the edges so its easier to cover all of the gaps. 2) When covering the corners of your pinboard cut slits in your ticket or flyer where it's going to fold over the corner, so it's easier to fold and glue down. 3) Try to avoid putting glue over the top of your tickets as it makes the writing fade so it's less readable. If you need anymore advice or help on decorating your pinboard don't hesitate to get in contact! "In crafting there are no mistakes just unique creations"